I've posted pictures from all of our cruise now, and I want to post a review and give some tips for the cruise line and cruise itself. There are things I wish I had known going into it that would have made my cruise easier and happier. We went on Royal Caribbean's 7 day cruise of the Western Caribbean leaving from Port Canaveral, FL. We planned to do a lot of relaxing on beaches, reading, and playing in the water. Obviously, that is not what happened. If you're going on the same or a similar cruise, there are some tips that can help you be prepared. Pack a change of clothes and swimsuits in a bag to carry on board the ship yourself. Your luggage might not be delivered for hours. The places we ported do not have easily accessible beaches, except for Royal Caribbean's private port in Haiti. If you want to visit the beach, plan to pay for a taxi or excursion. Look at the excursion brochures ahead of time. That will give you the ability to look online for reviews of the places available for visiting. I've heard from friends that it is cheaper to get excursions on shore. 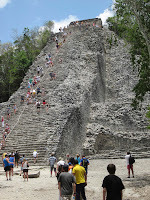 For the ease of our family, we chose to do our excursions through Royal Caribbean. There were two reasons for this- a) We didn't want to have to spend time once ashore looking for an excursion. b) We were going on long excursions that lasted all day for two of our excursions. We wanted to be sure to be back before the ship set sail. c) Some of our excursions started early in the morning, and being on a shipboard excursion allowed us to be the first ones off the ship. If you like soda, get the soda package. If you or your child does not drink soda much, don't bother. It's not worth the price for the amount of time you'll spend on board if you don't regularly drink soda. Scope out all the places on board ship that you can get cups of water. It's not obvious, and it can be frustrating. However, all the bars serve water. Go get yourself some. On Royal Caribbean, you can either pre-pay your gratuities, or you'll automatically get charged gratuities every day you're on board ship. This changed just before our cruise, so we weren't expecting the automatic charge. It does make it easier, though. Eat dinner in the main dining room as often as possible. The food is wonderful and the waitstaff is outstanding. We still miss our waiter. All the ports of call accept American dollars, but most give change in local currency. Take small bills. If your goal is to play in the water, go to Columbus Cove, where the water slide and aqua park are. We made the mistake of going to Barefoot Beach, where you really need water shoes. It's a fantastic beach, with great views, but the floor of the ocean is coral. It hurts to walk on it, scrape your knees on it, fall down on it... You get my drift. If your goal is water play, Columbus Cove is the way to go. Check out the zipline. It is great! But, it takes a couple hours. Be sure you sign up for it on board ship, and hotfoot it over to the zipline first thing so that you don't spend all day waiting for the zipline. The Aqua Park- All I can say about this is that Dominic and I found it almost impossible to get atop the floats, but the water felt great. There's a lot to do in Jamaica. Obviously, we highly recommend climbing Dunn's River Falls. If you're going to climb Dunn's River Falls, take water shoes. You can buy or rent them on sight, but you might as well just take them with you. If you're planning to buy the DVD from Dunn's River Falls, make a lot of noise and be animated so that you get on the DVD! The cave is great and doesn't get cold, since it is all above ground level. DON'T miss out on the jerk chicken. It is amazing. If you're going to be doing a long excursion, you should still have time to hit up the little market by the dock. They have some good souveniers there, so don't worry that you'll miss out. The one thing we didn't get to do that we wanted to do was a walking tour of Georgetown. We're big history buffs, so were looking forward to this. This excursion sells out quickly and we completely missed it. If you want to do this tour, be sure you get your tickets early. You can always trade them for another excursion later, or just get a refund. If you want to go on a dolphin or snorkeling adventure and don't want to have to get up before dawn, be sure you get them early. They sell out of the later times early. Georgetown is a tender port. You'll be riding tenders to and from the ship. 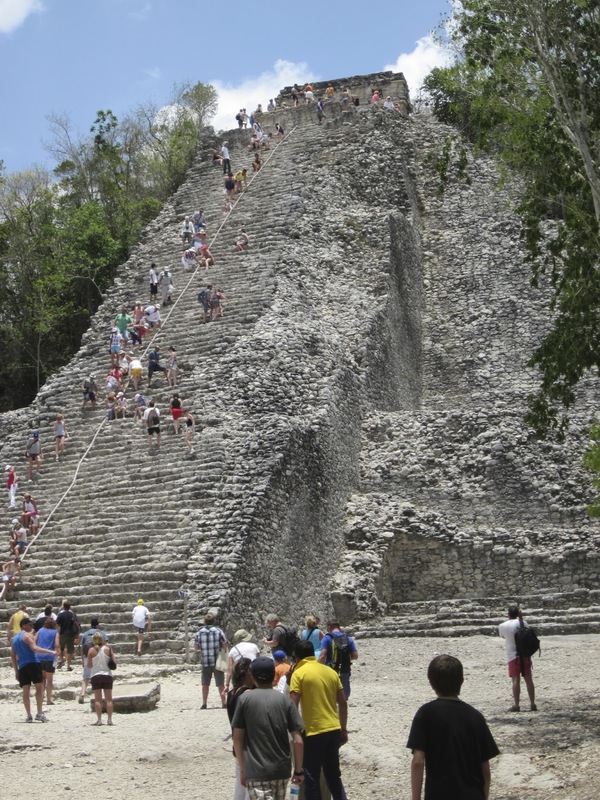 Cozumel has three options for Mayan ruin excursions- Coba, which I talk about in my blog post; Tolum, which friends really liked, but you can't climb on and the ruins have been restored extensively, which can be a boon if that's what you want to see; and some 'ruins' on Cozumel that are mock ruins, but are still pretty cool, from what I understand. Cozumel is an island. Many of the excursions are on the mainland. It's about a 30 minute boat ride to the mainland. If you experience motion sickness, be sure you take your medicine. If it's hot outside, be sure you get on the boat early enough to get an inside seat. There's no breeze, and the heat and be stifling topside. Cozumel has some great beaches, so this is a good place to go to the beach if you are so inclined. Back in the states- If you fly in, and your flight is later in the day, take advantage of Royal Caribbean's excursion to Kennedy Space Center. Their excursion includes the cost of the transfer to the airport, and is actually cheaper than getting into the Kennedy Space Center and the cost of the shuttle to the airport put together. It may actually be cheaper than getting into the Kennedy Space Center, which is amazingly expensive. It is absolutely awesome, though. Take extra money. Have fun. Relax. I have really enjoyed your vacation posts. My husband and I have done the eastern and western Caribbean cruises (NCL and Royal Caribbean). I loved seeing your pics as it reminded me of the fun we had. Thanks for sharing! Thank you! It was nice to be able to relive some of our own moments.